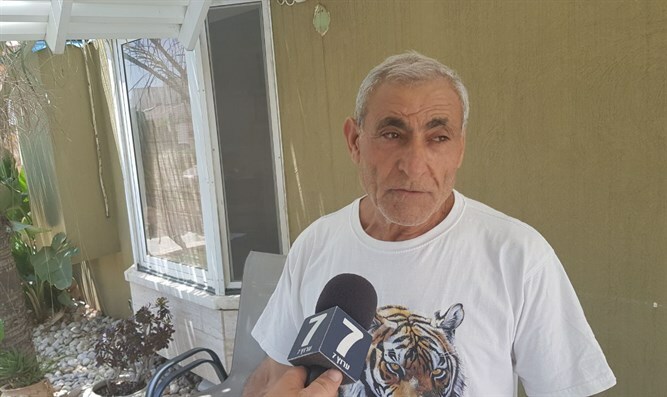 Sderot resident David Mansour, whose home was hit last night by bullets fired by Gaza terrorists, told Arutz Sheva about the incident and his feelings. "Last night there was a Red Alert; we were at home: my grandson, my wife, my daughter, and her husband. We were sitting in the security room. We waited and there was no incoming rocket. We went out and then suddenly bullets started flying here, near the car. I heard what happened. I came from the other side straight to here and saw the bullet lying in the road." To the question of how one who has "gotten used to" Red Alerts feels when witnessing such an incident, he replies: "It's a bad feeling, when you see it - this thing could kill you. It's not a joke; you're looking straight at it - this is death. What are your expectations from the army? Do you want to see them "going in with full force" or do you want quiet? "I'm not a politician, but I understand a little bit about the mentality. Today, thank G-d, America and the President are with us. I think we should direct it towards good, for peace, and not to direct it to war anymore; it's healthier for us as a people. What'll happen tomorrow, the day after when Abbas is gone and someone who won't recognize us comes in his place? What will happen then?" After seeing death with your eyes are you afraid? "Yes, it's tangible, it's not a game, my brother. The bullet entered the concrete here and exited and made a hole in the tire. You see it; it's not a game. If it finds me, G-d forbid, it ends my life. "It's important to me that the world and the people of Israel know what we're going through. I tell you that 70 percent of the public is suffering from anxiety; everyone's getting psychiatric treatment, and there's no such thing in any country in the world, with children born into this mess. You can't go on like this. All the wealthy people fled. The poor population remains here and they are wretched and helpless." Mansour also has criticism for the Prime Minister: "Bibi, I salute him. He comes here and flows money, but the money doesn't go to us, it goes to infrastructure, but that's how he silences the political leadership and we end up getting the brunt. That's the way it is." With all the difficulty, Mansour does not consider leaving Sderot. "My brothers tell me to leave, but where will I go at my age, where will I build a new life?" "Of course I like it. I like very much. I'm a native. I love my city. What to do? The heart aches at such a situation."